Google continues to be a spam search engine, nothing like the Google of 2005 or earlier. Matt Cutts and others at Google will claim that Adwords has nothing to do with organic listings, yet it does not take a rocket scientist to figure out that that the evidence says otherwise. What is wrong with this result? There are only two very weak links for a forum coming in. Third; as a 35 year expert in the field, this is not even a review web page, rather it is a selling page for a piece of junk (Green Killing Machine) that is only a UV Clarifier, NOT A UV STERILIZER!! 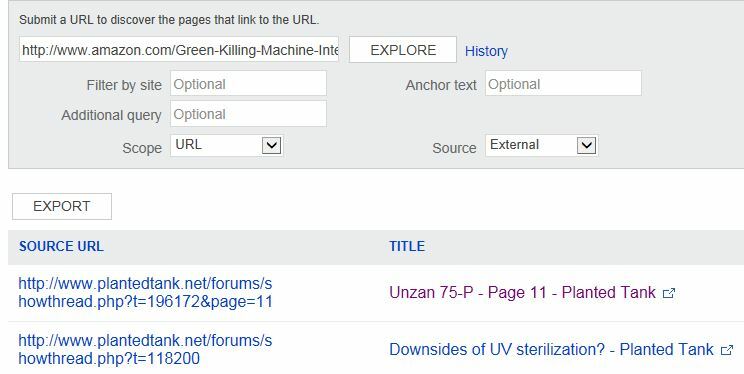 Since the term “UV Sterilization” is a process, a thinking person would expect an article/ web page dealing with this process, NOT a product. YET Google displays nothing but products from the usual junk aquarium product seller suspects such as Amazon, Pet Mountain, etc., etc. Google apparently gave their spam buddies at about.com credit for content of this article. It is obvious that about.com, Amazon, eBay, Pet Mountain, Dr. Fosters & Smith all get preferential treatment in Google search, as well as in Adwords as per cost per click. What do I think of Matt Cutts? I think he is an intelligent person, therefore he knows full well that most everything out of his mouth is a lie. He also should be ashamed of himself and his employer for all the small businesses and persons he has put out of work in this tough economy. As well he has caused great harm to the aquarium & pond keeping community with the amount of spam that now poses as legitimate results for many queries about aquarium/pond care. Maybe someday he will apologize to me and others instead of hiding behind his so-called Penguin updates. I would love to be proven wrong by this man. What is also troubling as I read more and more online as to how to appease Google in SEO, what comes up more and more is that the only way to succeed in Google search of late is to practice what is called “Black Hat SEO”. I suspect that Amazon maybe doing just this. For me, I have NEVER conducted my business since 1978 this way, as I have always placed honesty and integrity ahead of profits. So I am not about to now! Hopefully either the Mainstream Media will do their job and report what type of business Google REALLY IS, not the darling they portray Google as. OR persons will switch to the many BETTER search engines such as Bing or DuckDuckGo. This article calls out Google for content Plagiarism, Aquarium Fish Searches. As well it calls Google as they are; EVIL! *Is Amazon.com practicing Black Hat SEO?